Seaweed is an everyday miracle. The benefits of including seaweed’s optimum nourishment into your daily diet are extensive: increased longevity, enhanced immune functioning, revitalization of the cardiovascular, endocrine, digestive, and nervous systems, and relief from minor aches and pains. 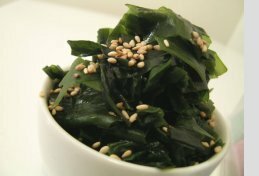 No wonder seaweed has been part of the traditional diet of all coastal cultures, including the people of Japan, Korea, China, Iceland, Denmark, Wales, Scotland, Hawaii, and the South Pacific Islands, and all the people who had trading contacts with the coastal cultures. ~ Protective - anti-radiation, anti-cancer, anti-oxidant, anti-toxic, anti-rheumatic, antibiotic, antibacterial, alterative. ~ Nutritive - trace mineral supplement, cardio-tonic, rejuvenative, aphrodisiac. ~ Mucilaginous - Emollient, demulcent, aperient, anti-constipative, diuretic. ~ Anti-stress- Analgesic, calmative, anti-pyretic. ~ Sauté onions in oil until brown. ~ Add all the remaining ingredients and cook until vegetables are done. ~ Adjust seasonings adding sea salt as needed and let mellow overnight or serve immediately. ~ Soak shitake and seaweed separately in hot water for 30 minutes. ~ Reserve the liquid when draining. ~ Slice shitake caps, saving the stalks for later use. ~ Bring the 6 cups water to a boil and add seaweed, garlic oil, reserved soaking liquid (minus any grit that settles to the bottom), and the noodles. ~ Cook uncovered at high heat until seaweed is soft. ~ Add tamari or miso after removing soup from heat and serve. ~ Soak the hijiki in the hot water and cut the celery and bok choy meanwhile. ~ When hijiki is tender to the tooth, drain it well and combine with everything else - dressing too! ~ Stir well and refrigerate overnight. ~ Any crisp vegetables may also be used in this marinade like sunchokes, water chestnuts, burdock stalk pith, cattail roots and so on. Visit Susun Weed at: http://www.susunweed.com and http://wisewomanbookshop.com.